Sunday 10th March,2013 was Mothering Sunday, but that was overshadowed this year by a very exciting event, namely the installation of Fr. Lazarus as the new Dean of the Cathedral. The cathedral was packed as nearly 500 hundred people attended. The new Bishop of the Free State, Fr. Dintoe, himself consecrated only the day before, led the proceedings and presided over the Eucharist. A large contingent of clergy from the Free State and elsewhere, as well as from Blackburn, supported the occasion, and the preacher was Canon John Hall from Blackburn. The music took various forms, starting with a Scottish bagpipe duo, there were majestic and rousing hymns, the Mass itself being sung by the Cathedral Singers who also sang two anthems. After the Peace we had a spontaneous rendering of various traditional choruses from the congregation. The skilful Odeion Mozart Players provided some of the accompaniment. 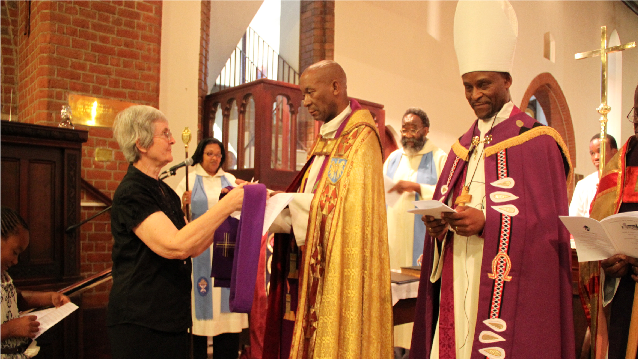 Blackburn Cathedral presented beautiful gifts both to the Bishop and Fr. Lazarus, the Bishop receiving a mitre, crosier and pectoral cross, with interesting histories, while Fr. Lazarus received a splendid cope. At the end of the service some very welcome tea and refreshments were served in the hall. Finally, Fr. Lazarus, were you not just a little nervous? You looked so calm, confident and dignified throughout, and we welcome you in your new role.